Electronic Arts and 38 Studios are giving gamers an incentive to pick up a first-run copy of the fantasy role-playing game Kingdoms of Amalur: Reckoning. An online pass included with new copies of the game unlocks seven House of Valor faction quests inside the gameworld. A new copy of the game for the Xbox 360 provided to GameSpot includes the online pass, and a statement to Joystiq confirms that first-run PlayStation 3 copies will also sport the pass. Downloaded versions of the game for the PC will include the content by default. It was not made clear if the House of Valor questline will become available as downloadable content for those with a secondhand copy of the game. As of press time, EA had not responded to GameSpot's request for comment. Writing on the game's official forums, 38 Studios community manager "Muse" noted that the House of Valor quests were not included on disc and then taken out. "The House of Valor content was not in the finished game/disc at one point, then removed. It isn't there and we're locking you out of it. The House of Valor was created as stand-alone content, and was always intended to be the first DLC. Instead of holding onto it and charging for it later, we opted to give it to everyone who purchases the game new, for free, on launch day." Kingdoms of Amalur: Reckoning is not the first EA-published title to sport an online pass. New copies of Battlefield 3, Dead Space 2, Need for Speed: Hot Pursuit, and several EA Sports titles all included onetime-use codes to download additional content. 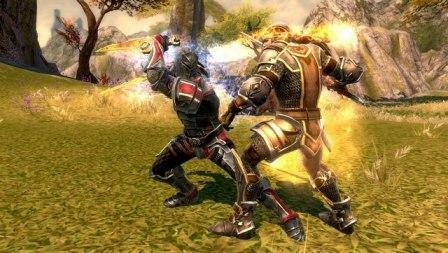 Kingdoms of Amalur: Reckoning is due out for the Xbox 360, PlayStation 3, and PC on February 7. For more on the title, check out GameSpot's latest preview.